Educators have always dealt with change, but the environment we’re navigating now requires change at a new level. Numerous other industries, including healthcare, have likewise moved from experiencing episodic change to this new paradigm where change is continuous. To survive and thrive in such a climate, successful organizations focus on continuous improvement and innovation efforts. Join authors Quint Studer and Janet Pilcher in their journey of partnering with leaders across the nation to achieve real results in school districts and healthcare systems. Learn how Quint, who spent the first 10 years of his career as a teacher, used his background in special education to successfully transform patient care, employee engagement, and leadership development practices in over 1,000 hospitals. He then returned to his roots as an educator by engaging with Janet to adapt and apply his nationally recognized continuous systems improvement model to accelerate key results in school districts. Maximize Performance outlines how this proven approach transfers to education through a mixture of stories and explicit teachings. Maximize Performance is a must-read for boards, superintendents, district leaders, and school leaders. The book describes the process our school district uses to transform our culture as we face constant changes in our profession. It contains a wealth of information that helps leaders think about how to face the challenges in front of us to achieve excellence. The process described promotes an open and transparent communication approach in which leaders are called to reflect on their own leadership skills and practices to be the best they can be. I've been in the profession for almost three decades. The application of the leadership principles described in this book has changed the impact of my work. Our school district performance is at an all-time high. This work has given our school and district leaders specific tools that prepare them to build a culture of engagement and service. 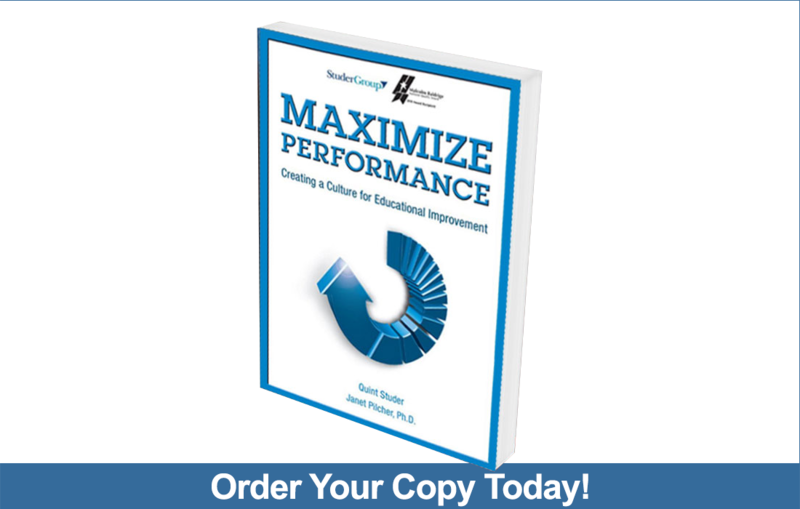 Maximize Performance focuses on creating an excellent school system. This work provides easy-to-understand tactics that academic and operational leaders can use to guide a systems-improvement process. Making the work stick matters. The Studer team has been with us along the way. In Education, even the Way We Change Has Changed. To Survive and Thrive, We Must Perform at a Higher Level - Continuously.